Presenting Born of Illusion #2 Born of Deception by Teri Brown. Circa 1920. Highly anticipated sequel to Born of Illusion. 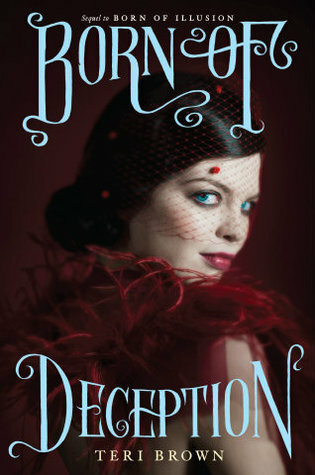 Born of Deception follows Anna Van Housen to London with its mysteries, the steampunk, a chance for her to perform her own magic show and a chance to meet other sensitives life herself. Of course, Cole, the love of her life is there too, so its double perk. But life it seems is not sunshine and roses for Anna, as she alights on English soil in the middle of a major predicament. Something treacherous and evil is afoot. Other sensitives are going missing, A murder and blood-letting and Anna has to make some pretty serious decisions about her life and regarding her safety. Teri Brown does a good job, shaping this sequel. Suffers a little bit on melodrama but the intrigue and trill of the first book can still be found here. Anna still remains the strong, stubborn and independent girl we saw in the first. A danger magnet if you will, one of the redeeming qualities about her? She is not perfect, makes a lot of foolish mistakes but at the end of the day she is a human and everything is acceptable if you learn from your actions. Cole, adorable and frustrating. He is like the epitome of a gentleman beau of said era. He doesn't know how to express his feelings well but come the time for being affectionate towards Anna, he is your guy. Dependable and helpful, he is the overprotective one who tries to help everyone in need and protects his loved ones with all his power. And seeing his relationship with Anna gradually grow was he highlight to this story. I had a few issues with the story, First there was actually no need for an apparent love triangle this time and the way they approached the culprit behind the disappearances and murders was too sudden and very predictable. Although I appreciated the action that followed but I had hoped that they could have spent more time going through the clues instead of the angst that was there between Cole and Anna throughout, But I liked how it ended and i'll say this again like I said in my review of the first book, there is actually no need for a sequel since both the books are complete in their own bounds but I will definitely check it out if another book follows next.